» Why Do Cats Bite? While it’s not the most endearing part of cat ownership, our beloved feline friends will sometimes cry and bite. Even though being bitten by your cat is an unpleasant experience, it’s important to determine why your cat is biting in order to figure out what to do about it. Cats bite for a variety of reasons, and not all of them are bad. In fact, biting (whether they are biting their fellow felines or their human guardians) plays an important component in feline play and affection. So, why do cats bite? 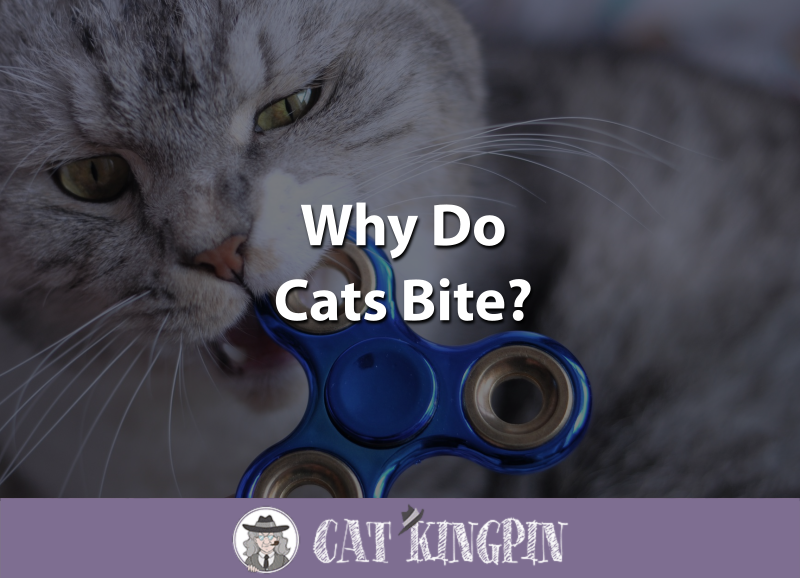 Well, there are a lot of possible explanations as to why your cat bites. Why Do Cats Bite For No Reason? Why Do Cats Bite Your Hair? Why Do Cats Bite Feet? Why Do Cats Play Bite? Why Do Cats Bite Each Other? When exploring why cats bite, it’s important to remember a few things about kitty anatomy. While cats do use their paws to express anger, fear, or playfulness, your cat’s main connection to the world is through their mouth. From early kittenhood, your cat has used their mouth to communicate with their mother and littermates, both in a positive way and a negative way. Your cat will probably continue to do the same thing with you once you bring them home, even if you don’t particularly enjoy it. Differentiating between a love bite (which is generally gentle and accompanied by nuzzling and purring) and an angry bite (which is not gentle and accompanied by hissing, putting their ears back, swatting, and growling) is easy, especially if you are well versed in kitty body language. Paying attention to the context clues surrounding a bite is important. For example, it may be difficult to differentiate between an anger bite and a fear bite. In order to correct the behavior (or modify yours), you’ll need to understand what has triggered your cat to bite you. Cats who bite out of fear usually do so because they feel cornered and will generally give you ample warning (such as hissing, cowering, or running away) before they resort to biting. If your cat bites you out of anger you may want to consider the provocation. Were you doing something your cat didn’t like? Did they warn you with a low growl, a deep meow, or a hiss? The best way to prevent being bitten by an angry cat is to respond to their warnings before the situation escalates. Cats can bite at any time, though they are most likely to do so when angry, afraid, playing, or cuddling. While the situation will vary drastically depending on the type of bite, most cats won’t bite out of anger or fear unless they feel it’s a last resort. In order to bite you, a cat has to get close enough to potentially put themselves at further risk. Most cats won’t bite out of nowhere, and most will only do so after having giving many warnings. Learning to understand these warnings is the first step in avoiding a cat bite. Cats also bite while playing, especially when they are young. Biting serves as an important method of play for young cats and kittens, and many adult cats will continue to play this way as they grow up. Sometimes a cat may mistakenly bite you (especially if they are trying to bite a toy). Other times your cat will bite you because they got excited and began to play too roughly. If your cat consistently bites you while playing you should avoid that type of play or simply stop before it gets too rough. Once your cat understands that a bite means the end of playtime, they will likely modify their behavior. Cats can also bite out of affection. Have you ever been petting your cat only to have them turn and gently nip you on the hand? These little bites are often called “love bites” and are a sign of affection and playful tenderness. Some cats will even bite mid-nuzzle! These “love bites” are often gentle and rarely hurt, but some cats may be overly exuberant. A sharp “no” is usually enough to deter your cat’s zealous love. They don’t. While the reason may not always be clear to us, there is always a motivation behind a cat bite. Cats who seemingly bite out of nowhere are reacting to some sort of external or internal stimuli. If your cat suddenly begins biting you without warning, the first thing you should do is take them to the vet to make sure there isn’t any underlying health problem that is causing this dramatic change in behavior. Cats in pain may bite, so making sure there isn’t a health problem that is causing your cat pain is the first step to unraveling the mystery. If the cat in question is a new addition to the household, they may be reacting out of fear or anxiety due to a new environment. Leaving the cat alone while they adjust is a good first step, as is offering them a safe place to hide and relax, such as the MidWest Curious Cat Cube. Changes in your cat’s environment can trigger behavioral issues. Did you get a new pet or bring home a new baby? Have you moved your furniture around? Consider what external triggers may be bothering your cat. You didn’t heed their warnings. Cats rarely bite without giving some sort of warning, whether it’s a growl, a hiss, or simply trying to run away. Ignoring your cat’s attempts at communicating with you may lead to getting bit. Is your cat spayed or neutered? If not, hormonal changes may be a factor. If your intact male cat senses a female in heat outside, they may act very erratically. The same thing goes for an intact female cat in heat. Hair is often irresistible to cats! It flows, it’s stringy, and it’s totally fun. Your cat may bite your hair for the same reason they’d bite a piece of string or yarn: it’s fun! If you don’t like it when your cat bites your hair the best solution is to deny them access to it. If that’s not possible, try spraying them with a water bottle or saying “no” very sharply to deter the behavior. Cats are notorious for being foot biters. Cats will often ambush your feet from a secret hiding spot, such as under the bed or behind the couch. If your cat is biting your feet, the most likely explanation is that they are playing with you. Feet have toes, move around a lot, and are generally tantalizing to our feline friends. It can be tricky to stop your cat from biting your feet. Telling them “no” or scolding them is a good first step, as is spraying them with a bit of water. You can also try spraying your feet with a chew deterrent, such as Grannick’s Bitter Apple. While this isn’t a long-term solution (who wants to spray their feet every day? ), one taste of the nasty stuff is usually enough to deter your cat for life. This spray can also be used to deter your cat from biting other things, such as plants and furniture. Ultimately, though, you may have to invest in a good pair of slippers and hope they grow out of the behavior. It’s just a part of life with a cat! Cats learn to play bite from a young age. Kittens will bite one another while playing, as this replicates skills they would have needed to learn in the wild. Most cat play simulates hunting and other predatory behaviors. Kittens learn to play bite when they are very young, and this instinct doesn’t always disappear in adulthood. You’re most likely to get bit during particularly exciting games, whether it’s on purpose or by accident. Learning to tell when your cat is getting over-excited is a good step towards preventing a bite during playtime. You can also invest in toys for your cat that keep your hands well out of harm’s way. Dangly toys such as the Rainbow Cat Dancer keep your hands at a safe distance from your cat’s mouth while providing tons of entertainment. It’s important to remember that your cat isn’t trying to hurt you! Scold them if they are very insistent, but try not to get angry. Getting angry or otherwise retaliating will only damage your relationship with your cat. Cats bite each other for the same reasons they bite people: out of anger, out of fear, while playing, or as a demonstration of affection. If your cats are biting each other affectionately or while playing, it’s best not to get involved. Cats are communicative creatures and will likely resolve any potential issues without human intervention. If your cats are biting one another aggressively then you may need to get involved. Cats who are biting each other in aggression will usually be growling, snarling, and hissing and their ears will be back. If your otherwise friendly cats suddenly begin to fight, the first thing you should do is bring them both to the vet to make sure there aren’t any underlying health issues that may be causing them to act out. If both cats are healthy, they are likely having some sort of territorial dispute and should be left to sort it out on their own unless the biting gets out of hand. If one of the cats is a new addition to the household, it may simply be that they need a little time to adjust to one another. Don’t automatically assume that a few tussles mean that the cats can’t learn to get along! And keep in mind that if a cat’s teeth gets knocked out, they are unable to regrow them. If the situation doesn’t improve with time, consider rehoming the new feline addition. If the cats are constantly biting they aren’t enjoying a good quality of life and it’s not worth the risk that they could become seriously injured or even killed. So, why do cats bite? Cats bite for a variety of reasons. While many cat owners go their entire lives without being bitten out of anger, most owners will experience a cat bite during playtime or out of affection at some point. Paying attention to your cat’s behavior before the bite is the best way to understand why they are biting. If your cat is biting out of fear or aggression, you should take them to the vet to make sure they aren’t in pain or suffering from a health problem before assuming the biting is behavioral. If your cat bites you while they are playing, you should invest in toys that keep your hands far away from your cat’s mouth, such as the Rainbow Cat Dancer (which is a dangly toy on a stick that many cats will find irresistible!). As far as love bites go… well, try and appreciate them for the sign of affection that they are! If your cat is a little too rambunctious with their love, you can scold them until they understand that you don’t like it. How do you handle a cat biting? Have you ever been seriously injured by your cat? Does your cat bite you to show you how much they love you? We want to hear about your experiences. Let us know in the comments!